We have an opening and a closing to pass along in North Brooklyn. 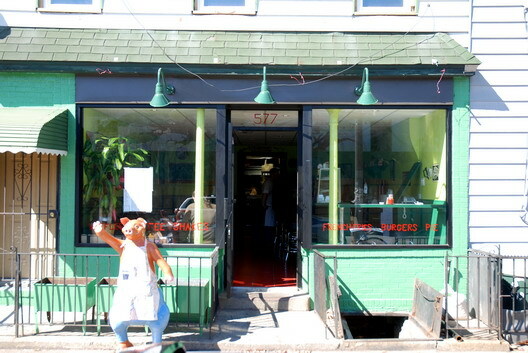 1) Jimmy's Diner is now open at 577 Union Avenue. It replaces Union Picnic, which closed. The menu run--no surprise--to diner food, with a lot of burgers and sandwiches on the menu. When we passed by on Sunday, there was a fairly modest brunch crowd inside. 2) We got word of this a while ago and promptly put it aside: The William Taft Restaurant in Greenpoint has gone belly up. At least, it has been sealed tight since before Labor Day. The Taft, you might remember was a vegetarian effort, but as one email put it, it featured "too much macrobiotics and not enough spice." It only lasted a few months. the taft didn't close because the business was failing (not that it was excelling, but the first 3 months of a restaurant are always hard) but because the person running realized it wasn't what they wanted to do.